Ayurveda, from ancient Sanskrit meaning Life Science, can be traced back over 5000 years ago in ancient India. It is the traditional Hindu system of medicine, based on the idea of balance in bodily systems, and uses diet, herbal treatment, and yogic breathing (pranayama) & meditation to re-balance the body, mind & spirit, thus restoring harmony throughout ones system. 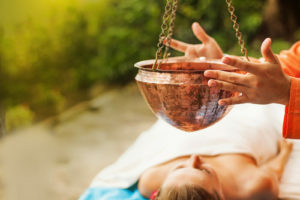 In Ayurvedic medicine it is believed that the unique combination of the three doshas (constitutions or physiological energy types) in a person influences physical, mental, and emotional tendencies, therefore Ayurvedic treatments balance the doshas, thus bringing the mind, body & spirit into perfect harmony. Ayurveda in Sedona is offered 7 days a week at NAMTI Spa! Traditional Ayurvedic full body massage with soothing, repetitive strokes using an aromatic blend of warmed, organic ayurvedic oils infused with medicinal herbs designed for doshic balance. The strokes and techniques work to open the energy points (marmas) of the body for energetic (pranic) balance and aids in the release of toxins, thus balancing the lymphatic system. Two-handed. Ayurvedic treatments are focused on personal balancing, cleansing & detoxification, single rooms only no couples. 60 minute / $99 , 90 minute / $129, or 120 minute / $159. Enjoy a relaxing mineral rich Ayurvedic foot soak followed by a natural Himalayan salt scrub ending with a foot & leg massage using specialty warm herbal oils, along the marma points (energy meridians) that promote healing & restore balance when stimulated. Perfect for stress relief, relieving fatigue, cramps and muscle soreness & more! Ayurvedic treatments are focused on personal balancing, cleansing & detoxification, single rooms only no couples. 60 minute / $79. It involves the warm, consistent flow of specially herbed oil on the forehead, specifically on the “third eye chakra” or energy point of human consciousness, between the brows. As the oil flows onto the forehead, the vibration/pressure can help balance the brain centers, synchronize alpha brain waves, enhance blood circulation to the brain, improve mental clarity & focus, release deeply trapped toxins, relieve stress, tension and insomnia, all while creating calm, tranquil bliss. Ayurvedic treatments are focused on personal balancing, cleansing & detoxification, single rooms only no couples. 30 minute / $69 as an add-on to Ayurvedic treatments only. Royal Combo – 3 hours for $289! A therapeutic & detoxifying package! Start with a 60 minute massage to release areas of tension then move into a 60 minute healing Abhyanga massage with medicinal warm oils and finish with a 60 minute VIP facial, including special masks, serums and/or peels customized to your skin. Leaves you feeling like royalty! Enjoy a great discount package or try new treatments on a monthly deal!